Ann is one of the Doctors of Veterinary Medicine here at Maple Lane. She and her husband Dave are the owners and the two veterinarians here that strive to give your pet the quality care they deserve. Ann graduated from Virginia Tech in 1981 with a Bachelor of Science in Biology. She then went on to the Virginia Maryland Regional College of Veterinary Medicine and graduated in 1987 with a Doctorate in Veterinary Medicine. She and Dave enjoy spending time with their three “young adults.” They also have four, four legged children, Henry, Missy, Trixie and Sugar. Dave is a Doctor of Veterinary Medicine and is also Ann's husband. Dave went to Ferrum College in 1978 after playing college basketball. He then transferred to Virginia Tech to study Dairy Science and graduated in 1980. He went on to graduate from the Virginia Maryland Regional College of Veterinary Medicine in 1984 with a Doctorate in Veterinary Medicine. After graduation, he opened Maple Lane Veterinary Clinic. Dave is committed to giving your pets the quality care they deserve. When not in the clinic, Dave is a “busy bee” farming and working around his farm. 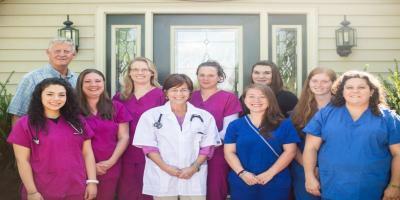 Jenn has been the Licensed Veterinary Technician at Maple Lane since August 2011. She graduated from the Veterinary Technician program at Blue Ridge Community College in May of 1994. Jenn is very passionate about client/patient care. She aims high every day as one of our technicians to make sure you and your pet get quality care and answers any questions you may have. Jenn is married with one son and they have two dogs, Suki and Beavis and two cats, Willy and Fuzzy. Sarah became one of the Licensed Veterinary Technicians for Maple Lane in early 2015. In 2009, she received her Associate of Applied Sciences degree from Blue Ridge Community College in Veterinary Technology. Here at Maple Lane, she helps the veterinarian run blood work, assists during surgeries and has many other responsibilities to help give your pet a happy, healthier life. Sarah currently lives on a small farm with her husband and their two energetic Australian Cattle dogs. Sofia came to us in January of 2012. She graduated from San Carlos University in Guatemala with a degree in Veterinary Medicine. Sofia is currently working on getting her license her in the states so she can practice as a veterinarian. Here at Maple Lane, her main duty is to assist the vet with surgeries and appointments. She is very passionate about felines, so if you bring in your furry feline, you can be sure she will give them lots of love and special care. Sofia is happily married and they have two kitty kids, Canela and Dully. Kassi joined Maple Lane in June of 2014 but has worked in the veterinary atmosphere for four years prior to starting here. She worked as a kennel assistant and receptionist for a veterinarian in Harrisonburg. She did work in a professional atmosphere for three years and realized her heart belonged in a veterinary office. So, here at Maple Lane, she answers the phones, assists clients and helps the doctor when needed. When she's not working, she enjoys riding her horse Apache, cuddling with her new baby girl and spending time outdoors with her husband and their four furry kids, two beagles and two cats. Tabitha came to our team in early 2016. She has worked in the veterinary field as a vet assistant and receptionist for six years. Here at Maple Lane, she assists clients with scheduling appointments, answers phones and helps the veterinarian when needed. She has a strong passion for the care of all pets and their owners. When Tabitha is not here working, she enjoys spending time with her family and fur babies.